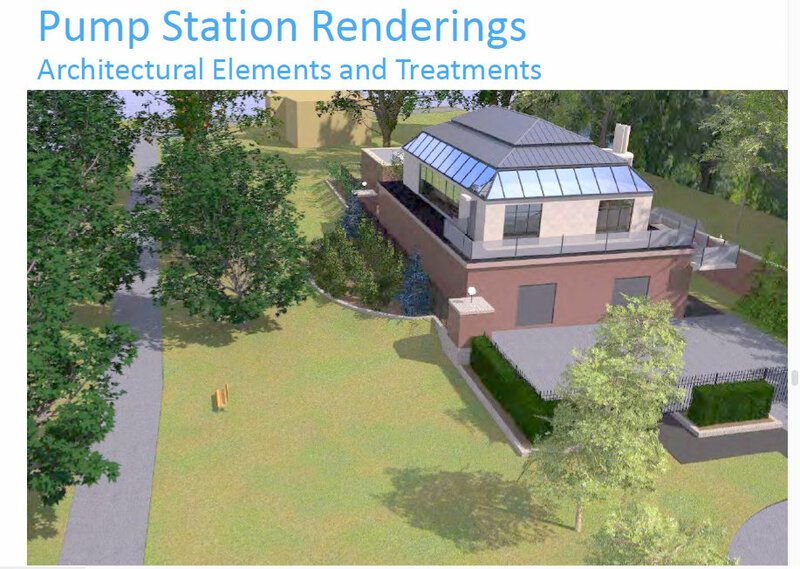 update (Wed., 9 AM, May 3, 2017): Last night’s informational meeting on the Pumping Station at St. George’s demonstrated a strong, thoughtful and neighborly opposition. Today’s article in the Gazette by Brett Samuels left out some key points. 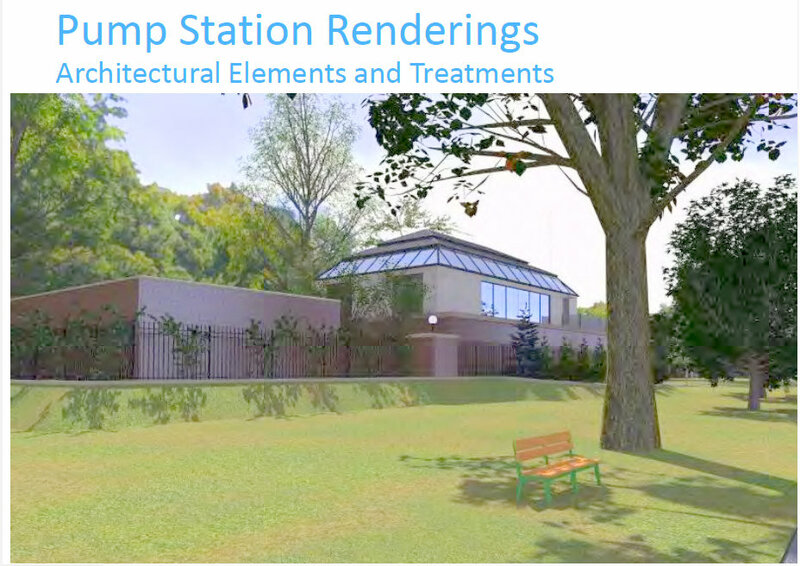 For a detailed summary of the meeting, see our post “strong, thoughtful opposition to pump station in the park” (May 3, 2017). 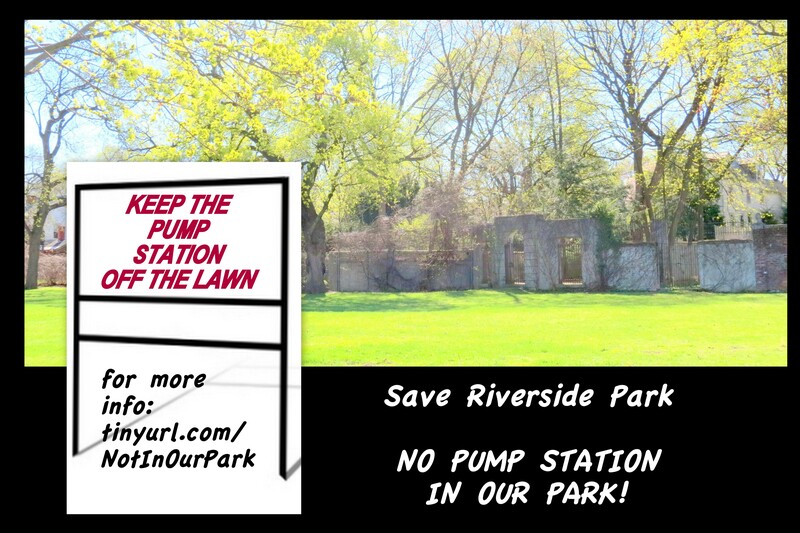 . . click for 3 printable “photo OpEds” to Save Our Park.
. . . 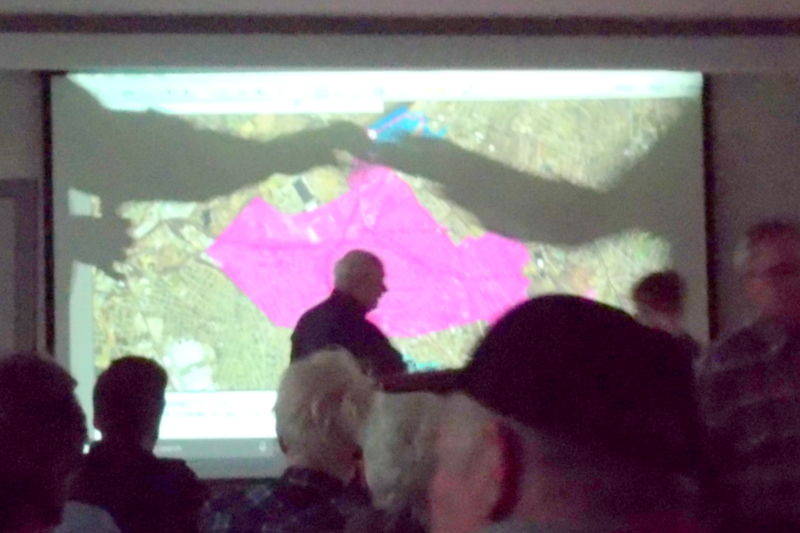 Original Posting (with updates and links) . .
. . click on rendering for larger image; full Presentation (pdf) . .
. . the SA Board and Officers never informed Members or residents of the Stockade of the size and location of the proposed Pumping Station until the last day of April, in the May Stockade Spy. Not used? Not appreciated and valued? 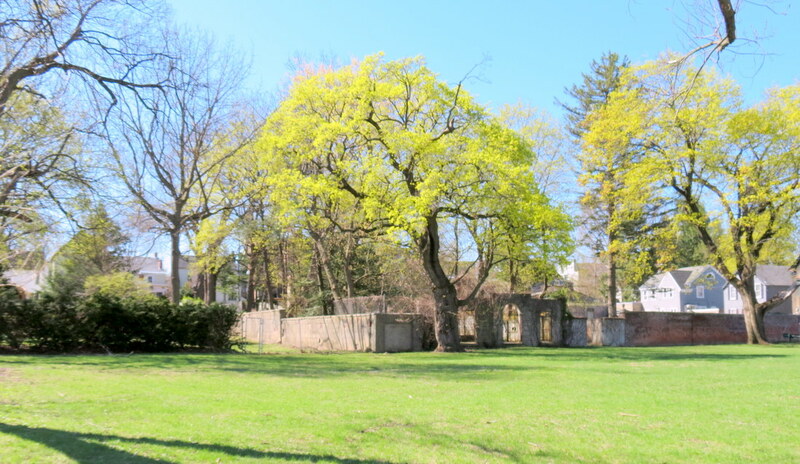 To the contrary, we stroll by the West Lawn of Riverside Park on the Park’s one footpath when entering or leaving the Park from Washington Avenue or Governor’s Lane, and enjoy both its calmness when unoccupied and its activity when in use. We play bocce and frisbee on it, and run with our dogs and children. We sit on its benches to read, watch sunsets and crew sculls, tugboats and party boats on the Mohawk, and also heron on the Isle of the Cayugas or Scotia shore. We have picnics there, or quiet dates on a blanket. We occasionally see wedding parties and fashion models being photographed in front of Governor Yates’ brick wall, and the unique ornamental wall at the foot of what is now St. George’s parsonage. We also very much enjoy a rare view of Stockade “backyards” — long, rolling or terraced yards of homes along Front Street. 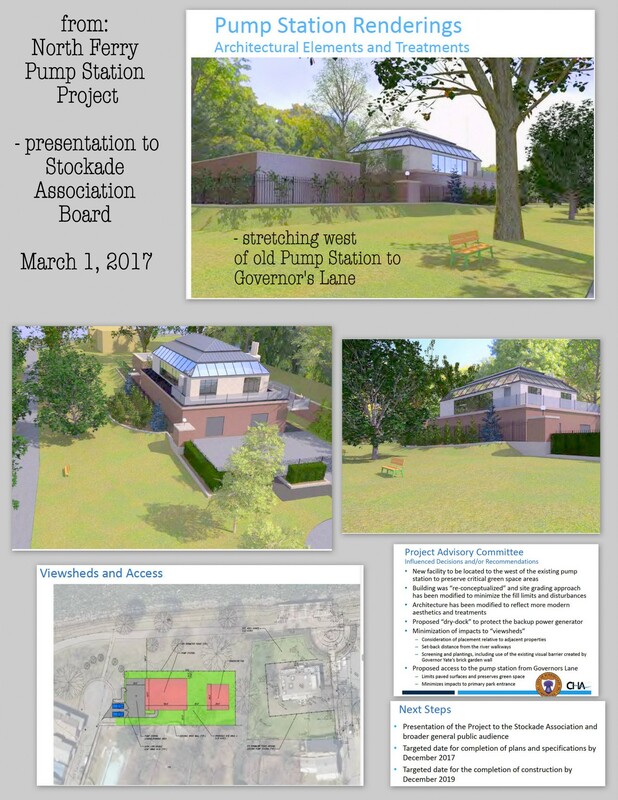 . . above: view on Sunday, April 23, 2017 . .
. . above: two renderings of the proposed pump station . . I hope there will soon be a full, objective discussion of the Proposed Plan and alternatives to it (e.g. reuse the old pump house and its present lot, or a different location outside of the Park, perhaps out of the floodplain), and I hope it will be led by an energized and responsible Stockade Association. To the right is a thumbnail image of a collage with salient portions of the March 1, 2017 presentation; click on it for a larger version, and feel free to download it or the Project pdf. file for distribution. 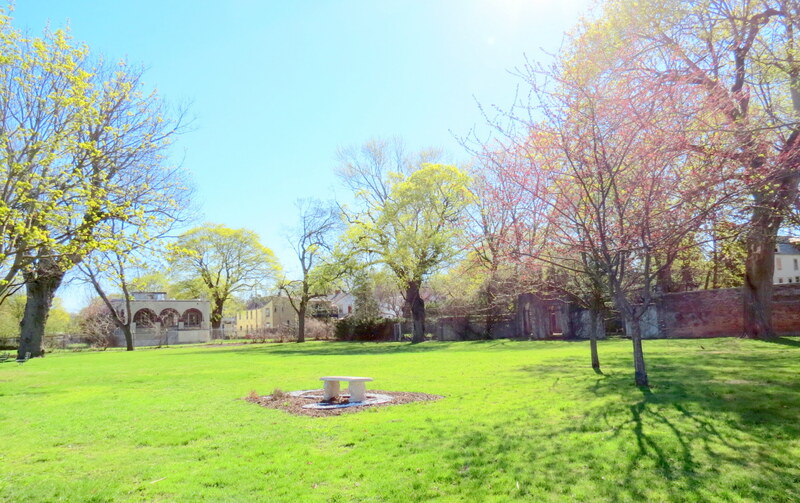 . . for discussion of reasons to oppose a Pump Station project in Riverside Park, beyond the beauty-tranquilty-heritage-etc. 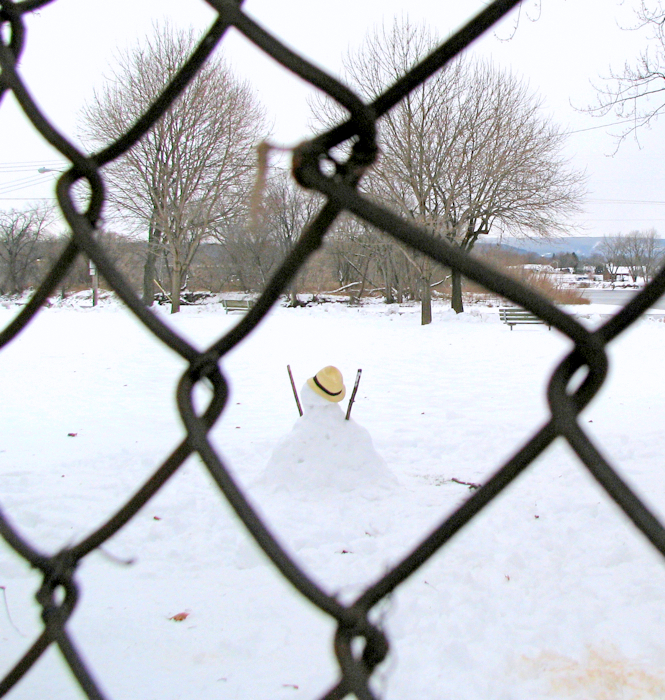 displayed in this posting, and to decry the failure of the Stockade Association to inform its members and protect the Historic District and the Park, please see “Not In Our Park!“, at the website “snowmen at the gates” . . 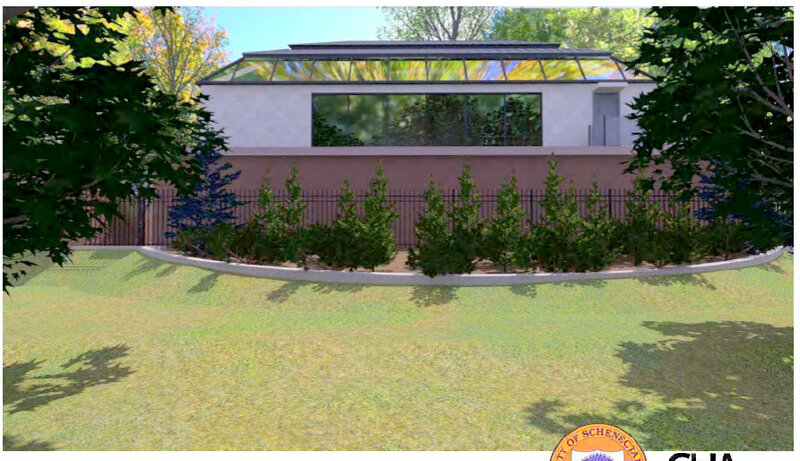 This slide show has photos of the West Lawn, with views of it and from it, as well as people enjoying it. . . a view from Scotia of the west end of Riverside Park (17Oct2013) . . 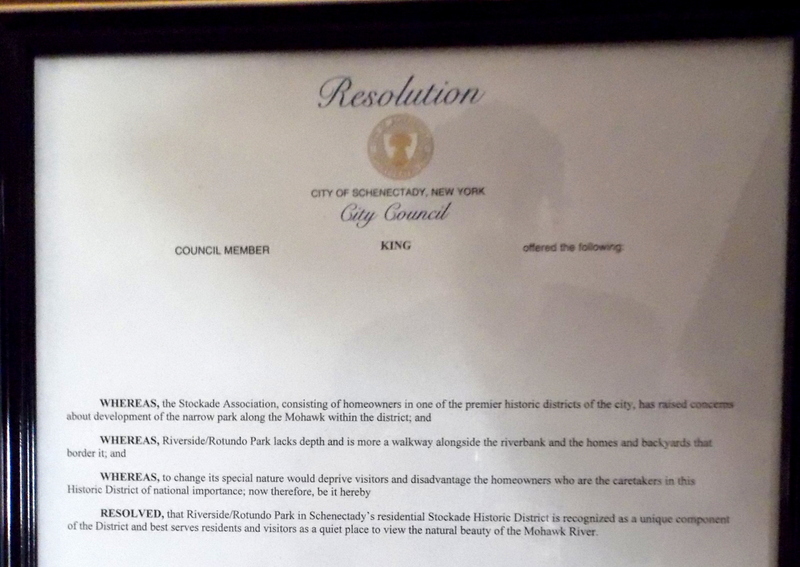 Note: Despite it Constitution and By-Laws, which commit the Stockade Association to protecting and preserving the residential nature of the Stockade district and to improve Riverside Park, the Stockade Association Board never notified the Association members or the neighborhood for two months after the March 1 presentation to them of the Project design. 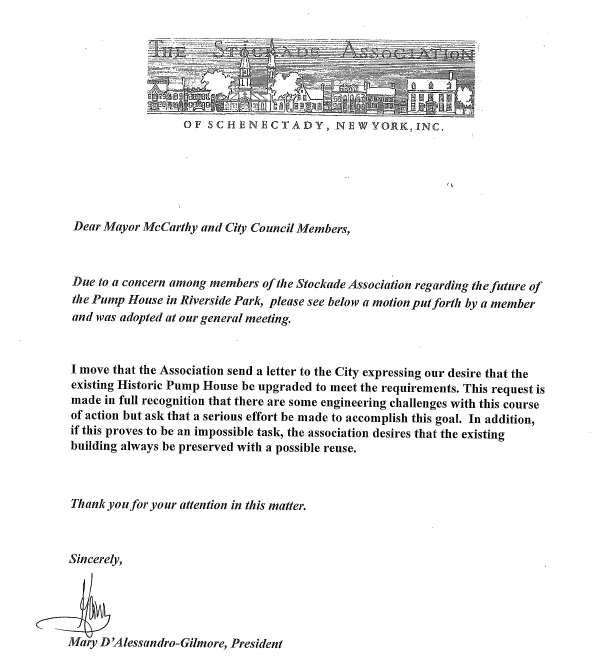 Moreover, in 2014, the Stockade Association president never put on the agenda or gave information to the Association and neighborhood about, the resolution before the City Council to place the Pumping Station in the Park rather than elsewhere, and rather than retrofitting the Old Pump House. 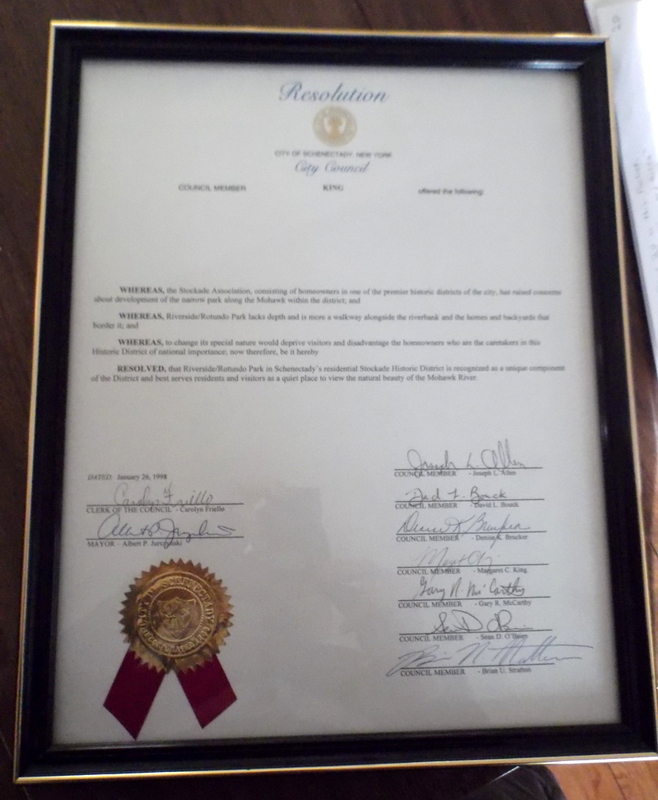 When a motion by an SA member passed at the May 2014 general meeting, asking that a letter be sent to the Mayor concerning the Old Pump House and attempting to reuse it if technically feasible, the dismissive, minimalist, undated, informal note to the Right was sent to the Mayor and City Council. 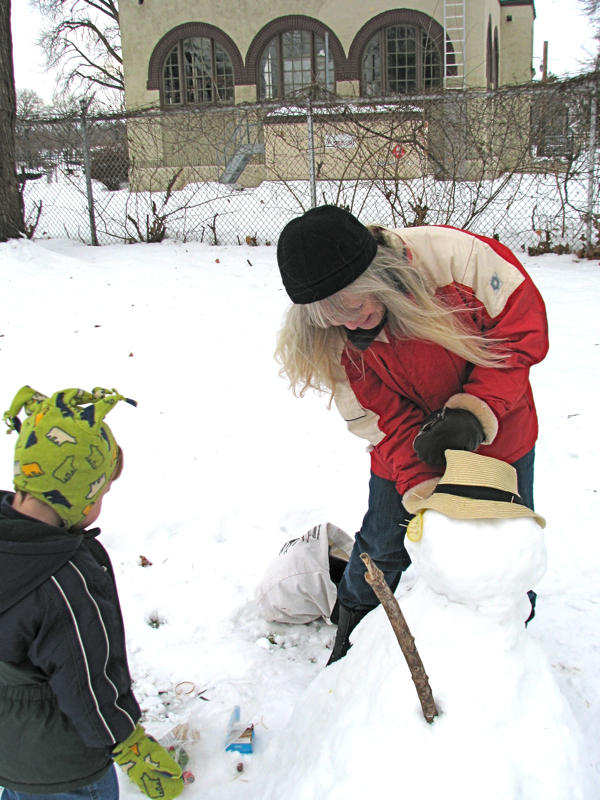 The matter was never again mentioned in the Stockade Spy or on the SA website in 2014.
above: [L] Loraine and Devin make his first snowman just outside the fence of 29 1/2 Front Street, in 2009; [R] Devin’s snowman is a lone sentinel outside the fence of 29 1/2 Front Street, echoing the famous, feckless snowmen at the gates of the Stockade the night of the 1690 Massacre.